The five leading players in the U.S. caps and closures for non-carbonated beverages market held a share of around 55% in the market in 2016, based on value, states Transparency Market Research (TMR) in a research report. Some of the leading companies operating in the market Bericap GmbH and Co KG, AptarGroup, Inc., Closure Systems International, Inc., and Silgan Plastic Closure Solutions have gained their leads in the market through extensive development strategies and high asset use in advancement and the establishment of more noteworthy number of assembling offices the nation over. While there is as yet a not too bad bit of the U.S. closures and caps market for non-carbonated beverages that has a place with restricted substances, bigger makers in the beverage industry are more mindful of the brand nature of the pioneers, along these lines putting more confidence in their items. The competition in this market is likely to intensify over time with market leaders expanding their reach throughout the country through long-term contracts. The small sized vendors have the benefit of adapting to novel technologies earlier while the large vendors wrestle with extensive switching costs. 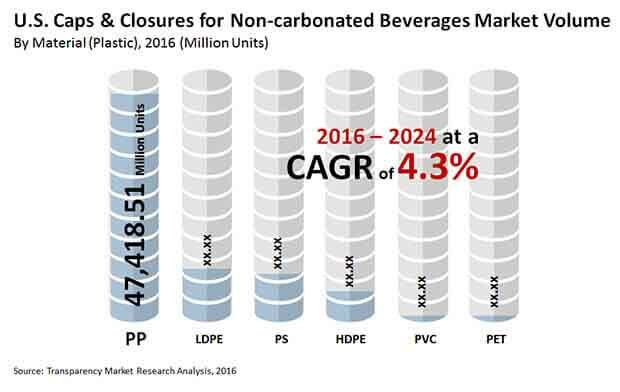 According to a TMR analyst, “The U.S. market for caps and closures for non-carbonated beverages is anticipated to register a 4.3% CAGR from 2016 to 2024. In 2016, the market was valued at US$2.64 bn and is likely to touch a valuation of US$3.82 bn by the end of 2024.” Based on application, the segment of bottled water led the U.S. market for caps and closures for non-carbonated beverages in 2016 and is likely to continue leading the market over the forecast period with a 6.1% CAGR. "One of the main variables adding to the current rise in the U.S. closures and caps market for non-carbonated beverages is the developing interest for single-serve drinks. The requirement for particular tops and terminations that supplement the much touted hot fill process that can build the timeframe of realistic usability of various refreshment sorts. Moreover, the general interest for convenience beverages and food is expanding at an over the top rate over the U.S., with an ever increasing number of shoppers inclining towards nourishments that are nutritious and additionally simple to eat. The U.S. closures and caps market for non-carbonated beverages fits consummately into this developing specialty and will keep on benefitting from this expanding request over the not so distant," states a TMR investigator. Different components driving the U.S. caps and closures market for non-carbonated beverages incorporate the expanding support created via regular refreshments and the occasionally expanding interest for frosty or hot refreshments, and the expanding acknowledgment of current refreshments by bigger socioeconomics and gatherings of people. One of the key issues that a great deal of producers in the U.S. caps and closures for non-carbonated beverages are confronting right now, is the cost for changing from current innovations to more up to date ones. This includes transforming from the polyethylene-based two-piece conclusion that utilizations compacted trim to the more up to date, HDPE one piece terminations that need infused shaping. The switch includes a great deal of costs and in addition a more elevated amount of mindfulness about conclusion applications for PE when contrasted with the PP. The whole circulation anchor needs to consider the change to one piece closures from two piece closures as the last is not as obliging about the assembling inadequacies in bottles.